These mugs are personalized with your family name and artwork depicting each family member. 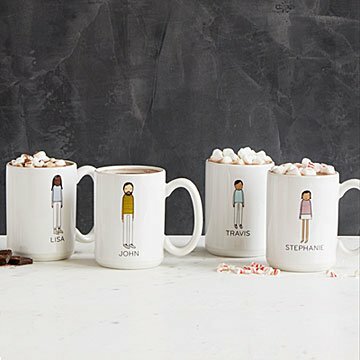 Characterize your family's unique collection of individuals with these personalized mugs featuring the sophisticated simplicity of Mary and Shelly Klein's artwork. One side features the artists' depiction of individual family members, personalized through your choices of skin tone, hair, clothing color, and the mug owner's first name, while the other displays your family name and year established (optional). Create a set to celebrate the individuals connected through your family ties, whether you're all around the same table, or enjoying coffee in different time zones. Mugs made in Tucson, Arizona, decorated in Rochester, New York. Love so much, ordered another set! They are simply adorable and quality is superior. The mugs are a great size and the artwork is so fun. Everyone loved them! I ordered these mugs for the families of three friends/relatives this past holiday season. They came out really nice and everyone loved them. I'm jealous, but didn't want to spend the money for my own family. My only complaint at all is that the personalization options are limited and, in some cases, the image did not resemble the person it was made for. More hair color/style and height options would be helpful. This gift was so well received! I got a pair of these mugs for my friends who just moved in together, they loved them! The mugs are the perfect size, & pictures are super cute! This will be a birthday present for my husband next month. He will get a kick out of it. Bought two of these mugs for my boyfriend's mom for Christmas with her sons names. They ended up being so cute that I got one for her and her husband as well for her January birthday. They ended up super cute and everyone has been using their name mug all the time. Size is fantastic as the mugs are slightly large, making them cozy and great for coffee in the morning. Would definitely buy these again. My boyfriend's mom is talking about getting these for her other son and his wife now. We love these! At first my family wondered why I bought them, but then quickly got it! They are great! Large mugs! Cute pictures that actually look like us! Fun! Your whole hand fits through the handle. It is large and holds a lot. I was a little disappointed that I did not get/was not offered more choice. I needed a man with a white mustache only not a beard.